August 1, 2008 – As Thom Yorke and band take the stage, a palpable roar erupts from the crowd at the start of what would be a performance that would leave an indelible mark on much of the audience. Headlining Lollapalooza, Radiohead delivered the highlight of the the three-day festival with an electric, crowd-pleasing performance that drew heavily from the band's 2007 release, In Rainbows, while still digging deep into the band's back catolog, highlighting obscure tracks and acclaimed arrangements alike. Due to the very high stage of the main stage at Lollapalooza, this shoot was an interesting contrast to the individual date at which I'd photographed Radiohead in May on the first leg of their North American tour. As such, the angles were a new element to the shoot and introduced various compositional factors to the performance. On a positive note, Radiohead's set had much more of the waning daylight in the lighting mix, an element that helped cut the monochromatic treatment of the band's current tour lighting. This was particularly true for their first song, “15 Step,” which caught a nice amount of the dusk lighting. Due to the height of the stage, subjects were primarily constrained to the three performers at the front of the stage: Ed O'Brien, Johnny Greenwood, and Thom Yorke. For this set, I relied almost exclusively on the Nikon 70-200mm f/2.8. Beautiful shots, Todd. I really wish I could’ve gotten there earlier to catch them. And that hollow body that Thom is playing is gorgeous. Hey Brian, thanks very much for the comment. I think I was really fortunate to be able to photograph Radiohead twice this year, first on their tour and then again at Lolla. Again, great to meet you on the last day of the fest! This set is stunning Todd! You’ve made a bunch of wonderful pictures ( i love radiohead ;))! There’s a lot of killer pics in this set, if i was an editor it would be very difficult for me to choose one! Hey Laurent! Thanks for the feedback, glad to hear you like the set. Let’s hope that some photo editors have that problem with some of the other sets, too! This was a very different shoot than when I photographed the band in May, but I’m pleased it was possible to make a small set of images even with the high stage. Great work, Todd! Radiohead can, I have to admit, look a bit dull in live photos at time, but I think you’ve done brilliantly here. Hi Kate, thanks very much for the kind compliment. Radiohead certainly does rock out in their own way, even with Thom’s dancing (! ), so I’m glad to hear that I’ve done them some justice in your eyes. I really have to tel you that these shots are amazing. I love the colors. Very well balanced. Hey Celso, thanks for the comment, glad to hear the colors work for you. The one tricky thing about Radiohead’s current tour is their mono-colored lights. I did get your email and will try to hit you back soon, thanks. This comment thread is going to be lengthy so I’ll just drop a quick “awesome as usual” in and let you move on to the next one :) #7 is my fav. Haven’t had to deal with too many high stages yet myself, outside of Linkin Park who put that riser right at the front of the stage. At least with that you could shoot around it. Always interesting to see how others handle the restrictions – thanks as always for the tips! Thanks, Keath. I’m just getting back to these comments now, they have piled up. I’ll have to check out your Linkin Park shots — Any tips? I’m photographing Projekt Revolution tomorrow. Wow, Todd, you get such stunning clarity in your shots. It’s really just mind-blowing. Hey Gabi, nice to hear from you here, thanks for the comment. Clarity is always a goal of mine. Thanks, Chameleo. Inspiration is a high compliment to me, so thank you! I have seen your shots on the Retna site (I submit there as well.) and always enjoy what you do. Just recently discovered your site and like that also. Hey Brian, thanks for looking me up. I just saw your name the other day while checking out a gallery pulled together from various agencies. Nice to hear from you, thanks for the kind words. Dang! The lighting for this seems amazing. I am diggin 1 and 4. The whole set is really something! The lighting was a nice surprise, I was very glad to get a little daylight for the first song. By the second and third, the dusk light was pretty much gone, as the sun had already set and we were just getting the last wisps. Thanks for your comment. Hey Jorge, glad to hear you enjoy these shots. Naturally no band can suit everyone’s tastes, but Radiohead really does put on a great live show. Good to see what the small shapes I saw in the distance at the LCCC in Manchester actually look like! Great photos and thanks for sharing some of the production details. Hey Jenny, thanks for the comment. Glad these shots could help “complete” your experience, I hope you enjoyed the light show at Manchester! Just sent you an email through your Contact Page with Projekt Rev info. Can’t wait to see your shots! Sure is a change up from the stuff we’ve been shooting, that’s for sure. My picks: 1, 6, 7, 10, and 13. I like the color washes — they don’t seem “too much” for the majority of the photos, and rendered the skin tones really well. I don’t think I can narrow it down to one on this one — musta been a difficult change-up for this set having to use the 70-200 primarily — but I think you did well getting different angles and shots with just the telephoto. However, I gotta take of 4 points because this looks too similar to this , but I could be wrong ;) haha. And I have to take 100 points from Lollapalooza for a crappy stage that didn’t allow your 14-24mm. Great set Todd! I’m shooting these guys this weekend and it’s always nice to get your shooting notes before the show. Thanks again! Amazing shots. Love the colors! Amazing photos from an amazing band. What else could we ask for? Hey Daniel, thanks! Colorful moments were in no shortage for Radiohead with their stage setup. Thanks for the comment! 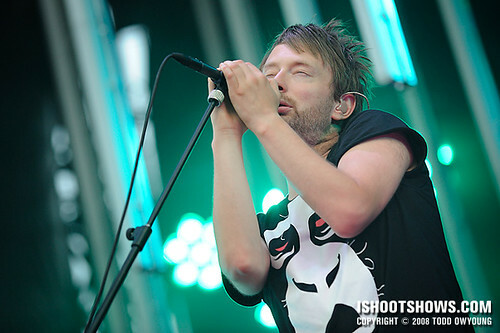 I just discovered your website a while ago and those radiohead photos are brilliant. they’re great in many ways. one question though, does the high stage at lolla made you unable to take shoots of the rear part of the stage? I can’t seem to witness Phil and Colin. Hi Kia, thanks for your comment. Glad to hear you enjoy the work here. Yes, unfortunately the high stage at Lolla made photographing Phil and Colin impossible. I have some shots from their solo tour earlier this year that were shot at a venue with a lower stage, and may post those. I’ve got a few shots of Phil and Colin in those. Thanks again! Thanks Todd, I was there and it’s so nice to see relive that concert through your photos. 10 years now! That really means a lot to me, I am glad these photos did that for you!